We all marveled when Chargers rookie right tackle D.J. Fluker body-slammed Raiders linebacker Sio Moore the other morning. Because, like, whoa: That's a mobile, 240-pound man in padded gear Fluker just picked up and tossed into the ground. 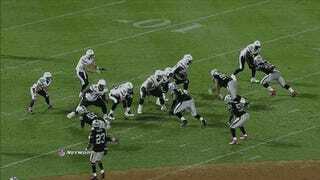 But the play may have cost Fluker more than just a 15-yard penalty for unnecessary roughness. "I felt it then," Fluker said. "A couple plays later, that's when I really felt it late third quarter." "It wasn't worth the injury," Fluker said. "It was worth the play. ... As an offensive lineman, I'm taught to finish, finish, finish." Fluker did return to practice in a limited role today. Heading into Monday night's game against the Colts, Chargers coach Mike McCoy said Fluker would be "day to day," which pretty much makes him like the rest of us.